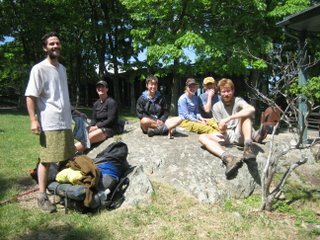 1,500 thru-hikers, full of passion, hope, and dreams, began a long and arduous journey at Springer Mountain last spring, with the goal of reaching the northern terminus of the Appalachian Trail. 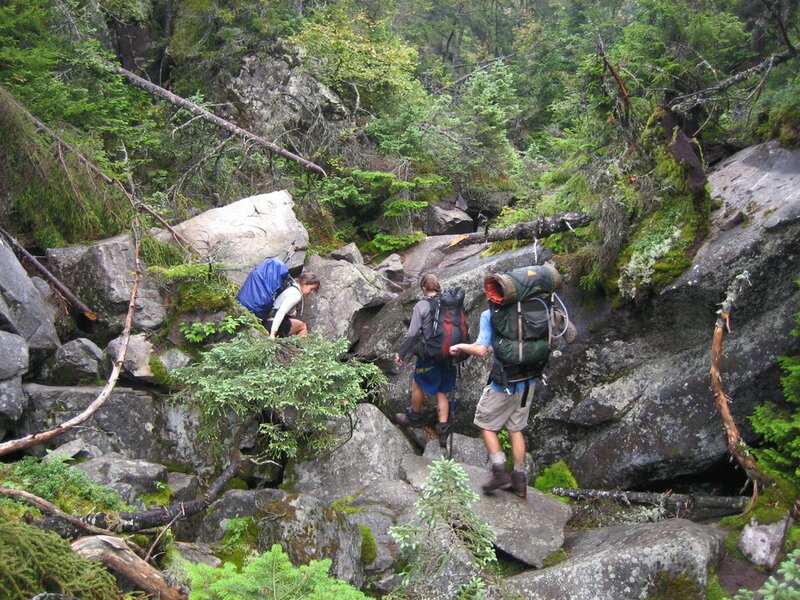 Starting in February, throngs of veteran and rookie hikers began the trek that passes over mountains, across rivers, around villages and always north toward Mt. 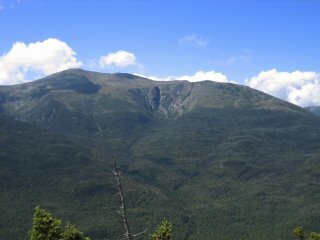 Katahdin. Hikers begin this journey fully aware that the odds of actually succeeding in this endeavor are relatively low, even though, every step they take increases their chances of completing the exasperatingly long footpath. 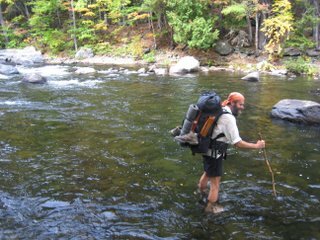 The odds of finishing what they have started become greater and greater as hardships appear and hikers disappear. Hardships: illness, rain, cold, injury, heat, insects, loneliness, fear, floods, boredom, disappearing finances, loss of desire. Always, there are more reasons to quit than there are to continue. 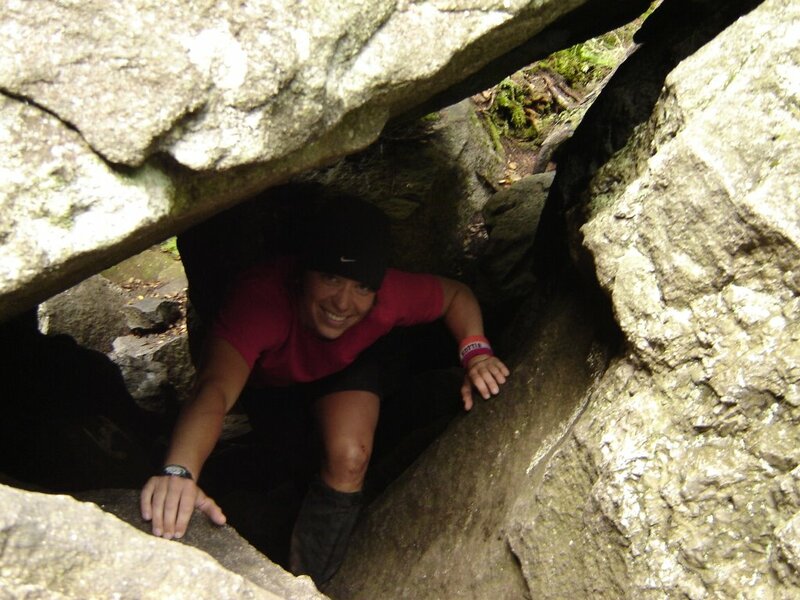 Always, hikers are trading comfort for such things as misery, pain....yet there is freedom in this. A freedom of mind and spirit that cannot be mirrored in regular, everyday life. 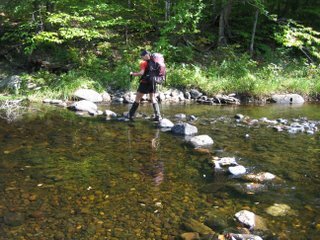 There is satisfaction in each step, no matter how pained, knowing that each step is one less step they will have to take in their quest for Katahdin. 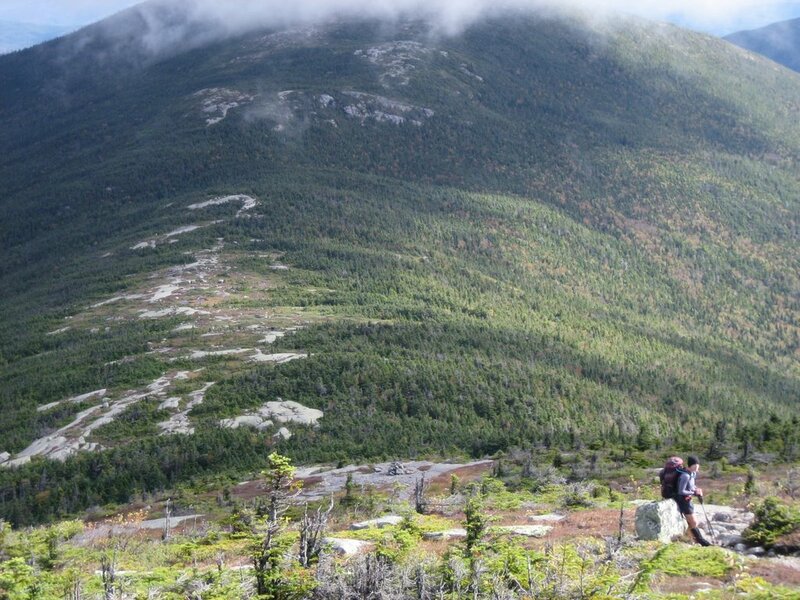 I began this journey with the 1,500 other hikers last spring. 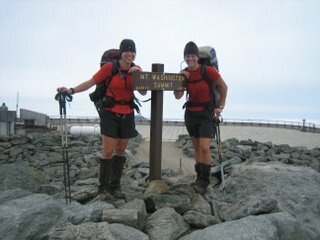 I was hiker #901 when I started in Georgia. 900 hikers began before me, and many more were to follow in my footsteps. 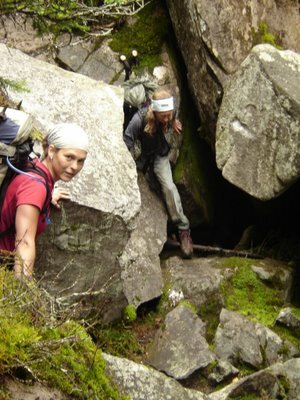 I experienced the jubilation of climbing hundreds of granite pinnacles reaching toward the sky. 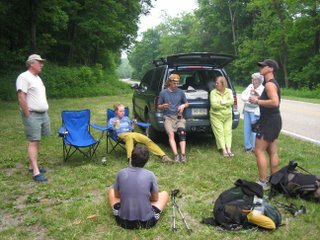 I experienced the camaraderie and fellowship of a community of people all in pursuit of the same goal. I experienced pain and misery, both physical and emotional. I walked, I stumbled, I fell, I got back up and I walked and walked. 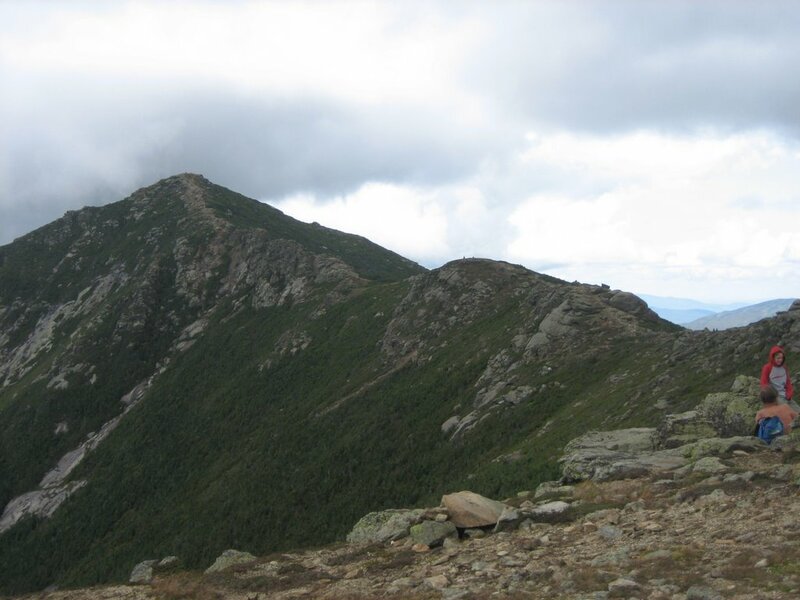 The odds were against me, yet I thought not of them, but of the sign on top of Katahdin that would one day welcome me home. Not a day passed where I did not think of that last mountain, and the desire and dreams that it encompassed, not only for me but for hundreds of others. 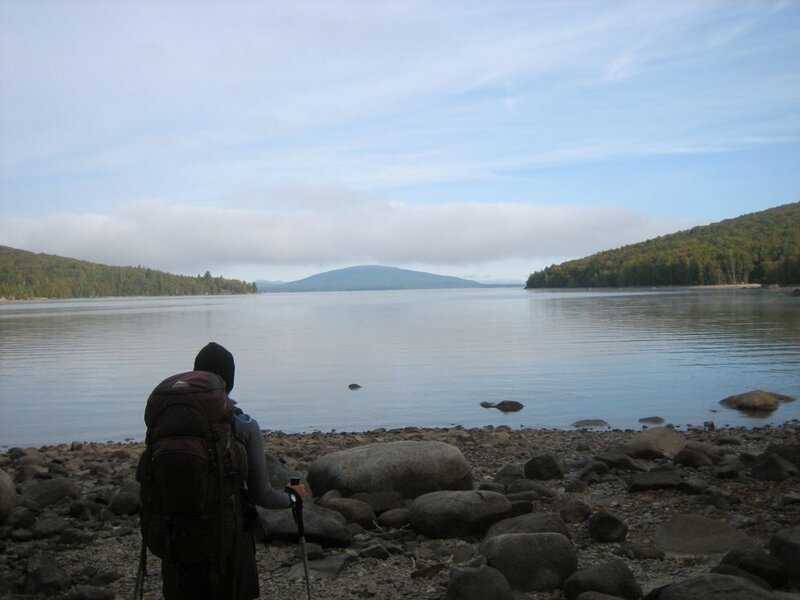 And then it happened: I woke up one morning, put my boots on, like every morning in the last six months, strapped my pack on my back, started toward the first white blaze I saw on a tree, and realized -- this is it. 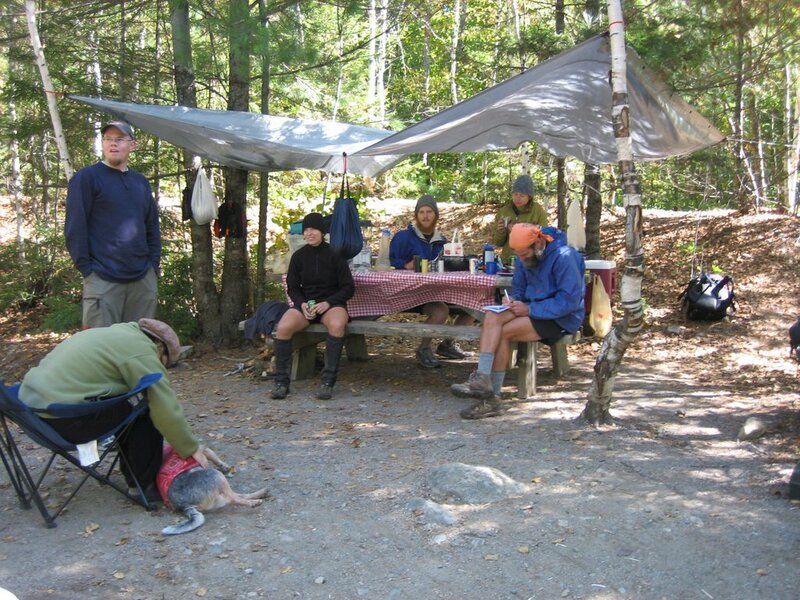 I am at the base of Katahdin, 5.2 miles from the finish line. 5.2 miles from the sign I've been dreaming about for over a year. 5.2 miles from the culmination of a lifetime of memories. 5.2 miles from home. Is it possible? Hiker #324 - that is me. 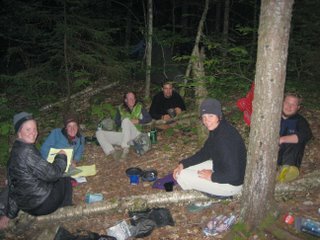 323 other thru-hikers paved the way for me to follow this year. Here I am finishing what I started on April 4th, nearly six months ago. It is now a reality, a dream no longer. I am steadily climbing the longest sustained vertical rise on the entire Appalachian Trail. 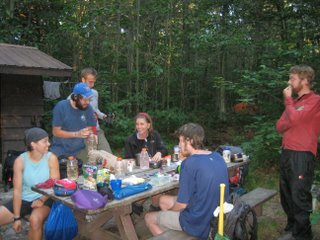 Over 4,000 vertical feet to reach the peak of Katahdin, which rises a stunning 5,267 ft. With my fellow thru-hikers I climb for four hours, trying in vain to let it all soak in. Stopping to look about at the expanse of earth that lies directly below me at my right and left. One foot in front of the other, one hand hold and then another. Slowly, carefully. Do I want to rush this? It will be over soon enough. After the sign at the top...then what? No more white blazes, no more of this life that I have grown accustomed to. Good-bye to my life long friends. Good-bye to this dream that I have been living for half of a year. Half of a year! Could it be possible that I am here? Ascending the last few steps of a journey that has built me up and torn me down? A journey that has rocked the core of who I am. A journey that has helped me look through all of the layers of protective walls that I had built around myself to survive in society, and see who I really am. To confront the ugliness that lies within. To realize the strength that had lain untouched. This journey is about to end. These are my thoughts as I grew closer to the final peak. The excitement, satisfaction, and elation were nearly masked by the dread of the job nearly complete. I was not expecting those feelings to aggressively come forth. Only a few more steps and here I was wrestling with these thoughts which were fighting to steal my joy. 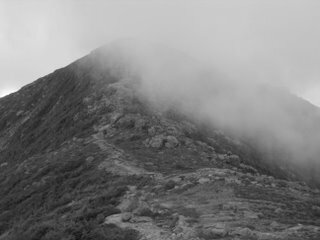 Fortunately the emotion of taking the final step, seeing and touching the Katahdin sign at the top of Baxter Peak, overcame the battle within. With a feeling of reverence I approached the sign, ran my hand over the letters, and shouted for joy. Against all odds -- I made it! #324, that is me. I too, completed the 2,174 mile journey and gained so much more than I lost. We experienced random acts of kindness by strangers in nearly every state that we walked through. 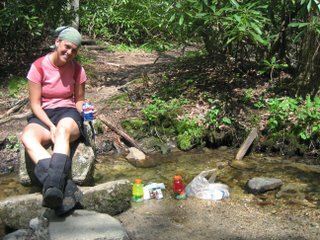 Sometimes we found gatorade and other assorted drinks cooling in a stream. 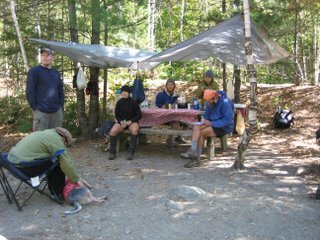 Other times the trail magic was quite a production, with many folks coming together to serve the stinky hikers. Regardless how simple or extensive the trail magic was, magic was magic. It instantly brightened our day. Many thanks to the selfless people who thought to encourage us along our long journey with food and drink. 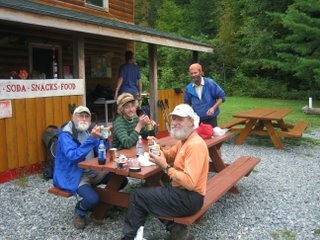 Thru-hikers form a very tight community as they make their way from Georgia to Maine. We laugh together, we cry together, we eat together, we sleep together, we celebrate together, we even play together. 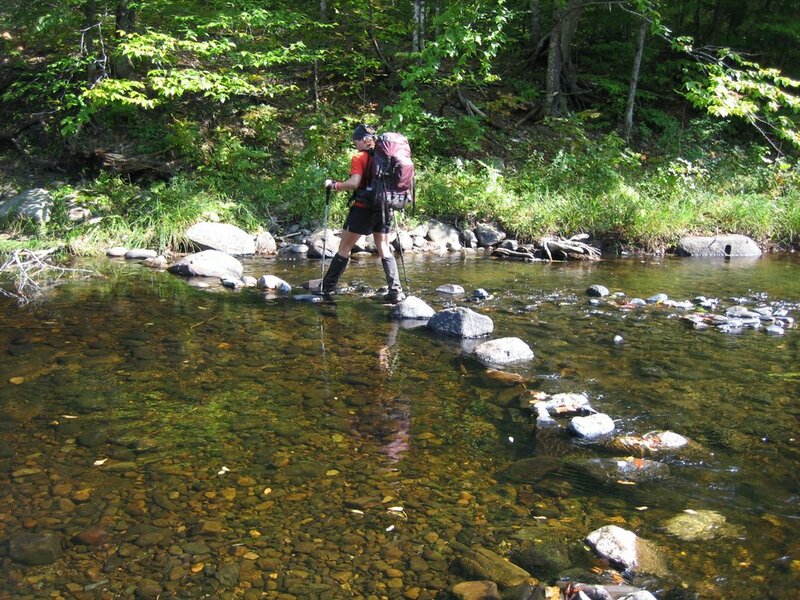 Crossing brooks, streams, and rivers in Maine occurred numerous times a day. The difficulty of the crossing depended on many factors. 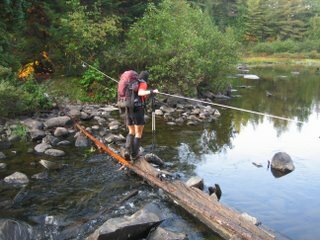 Here are a few pictures of the different types of water crossings thru-hikers attempt. The last picture is our friend "#2". He hiked the trail in 1980 for the first time. This year was his second thru-hike, thus the name, #2. These pictures speak for themselves. Oh Maine, how I love thee! The most technical mile of the entire Appalachian Trail took us 2 hours and 15 minutes to complete. 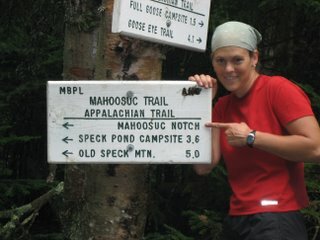 The Mahoosic Notch was definitely "all it was cracked up to be". 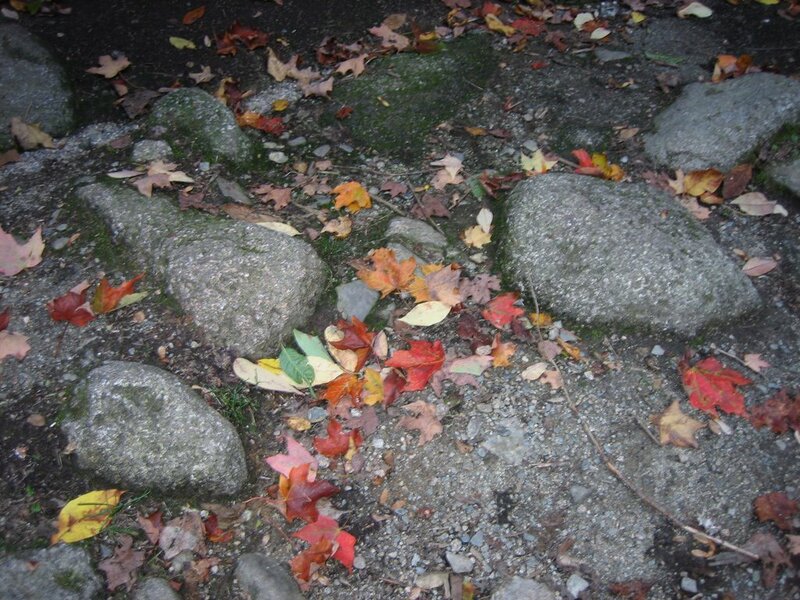 The boulder pile that is essentially known as the Mahoosic Notch is situated in a steep-walled valley that rose high into the sky blocking any morning sun that might warm our bodies. 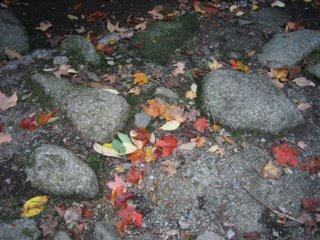 The stones were still wet from the two days of rain previous. The toe and hand holds were crucial, yet nearly impossible at times. We went in as a group of four in order to help each other. Success was dependent on the team effort. 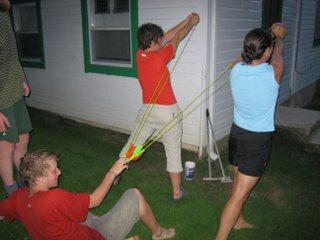 We were forced to take off our packs twice to fit through the tight places. Exhaustion met us at the far side of the notch, and this was just the beginning of the day! Mt. Washington had generated a lot of buzz since the beginning of the trail (way back in April/May) due to the fact that it is unofficially the second highest mountain on the trail. Second only to Clingman's Dome back in Tennessee. It felt like some sort of rite of passage to step over and past the summit of that great mountain. A day or two later we were looking back at Mt. Washington from the Wildcat Peaks (across the valley). It was so strange to look backward at the granite pinnacle. We had been talking and thinking about it for so long and now the challenge of it was gone. The mountain had been climbed. We stared at it for a long time not really knowing how to feel. The pictures turned out great, though. There were easier ways to get up and down Mt. Washington. 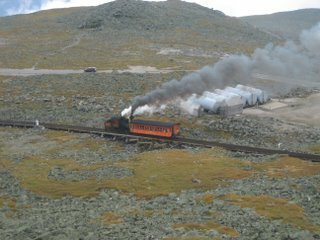 The "Cog Railway" pulled one boxcar at a time up the steep winding tracks that led to the top. 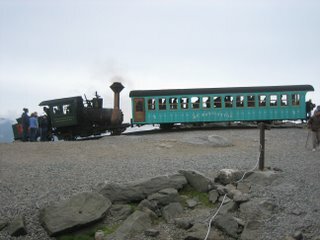 I was kind of glad I was in control of my own transportation up and down that mountain. It looked kind of scary. 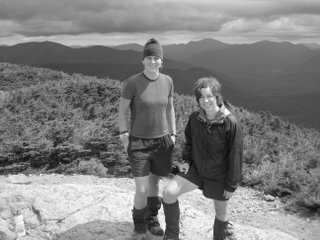 After passing into New Hampshire we quickly became acclimated with hiking above treeline. Franconia Ridge was our first taste of what the White Mountains might dish out: beauty, solitude, escape, raw power, entrancement. See for yourself! 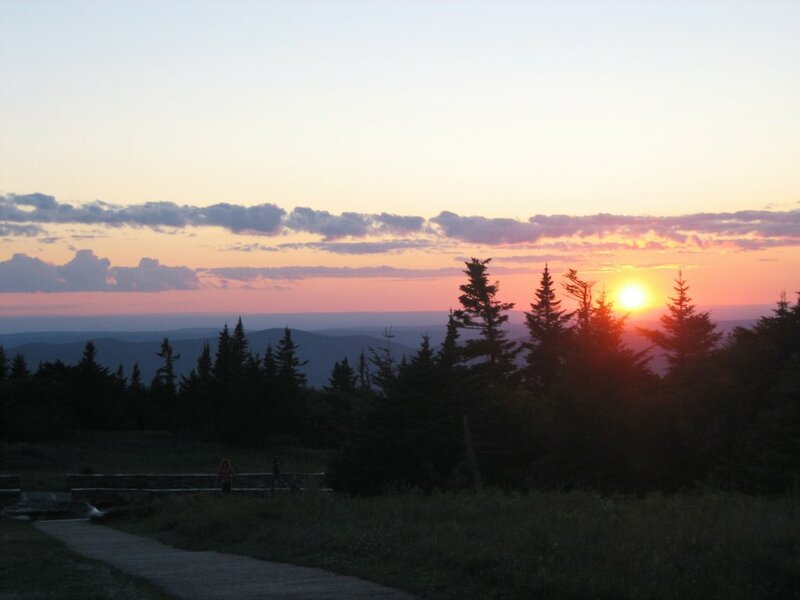 Photos from Massachusetts and Vermont. Some of my favorite trail passed through these two states. 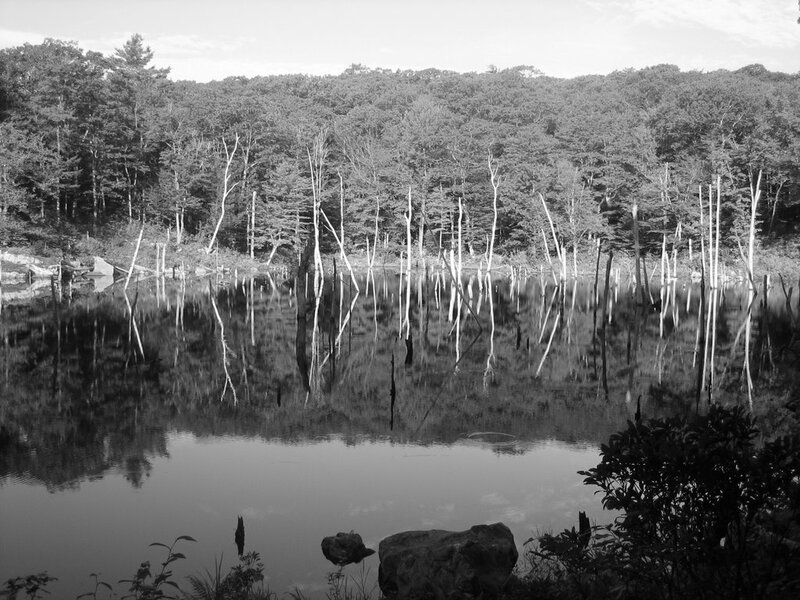 Here are a few reasons why this part of the trail rocked. Maine, Maine, Maine! Been moving through Maine at lightning speed. First it was to outrun the dreaded rains from Hurricane Ernesto (or was it a tropical storm?). Now it is because we are so close to Mt. Katahdin, we can smell it. Maybe we can't really smell the mountain, but there are some changes in the air. Fall has arrived. The trees first started changing a few days ago, and now each day the colors are more vibrant. 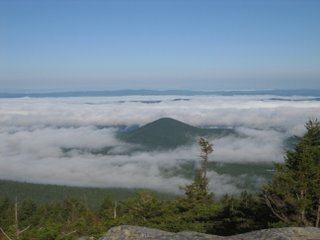 The panoramic views from Saddleback Mt and Horn Mt have been quite rewarding. Maine is such a great place to hike with all of its ponds and bogs. If you can get past the part where you have to hop through and around all of the mud holes, it is just downright beautiful. Saw our first moose from across a lake. Not much of a sighting. Looked pretty much like a brown dot from afar. Still waiting for the "close encounter". Still scrambling over and under rocks and boulders. I've busted a spot on my right knee three times in the past three days. Not going to heal if I keep banging it around. It's brutal some days! The last rainshowers brought with it a cold front. The days have been beautiful, crisp, cool. The nights are getting down in the 30s already. Brrrrr. We have arrived at Stratton, ME. Staying in a hostel at the Stratton Motel. Free internet, and long distance phone calls. Hard to beat, right? Especially since my phone card is running on fumes right now. Our planned summit date of Mt. Katahdin is September 24th. That is if everything goes as planned (which rarely it ever does out here). We will leave a two or three day window of time open in case the weather delays our summit. We are definitely feeling the pull of the big mountain at this point in our journey. From some of the nearby mountain summits we can catch tiny glimpses of our final destination. We are almost home. Thanks to all who posted concerning the rules and regulations of Haiku Poetry. And of course your own haiku poetry has been fun. Keep it up! I would attempt to write some now, but I have been notified that my "library internet" time is now ending. Until next time.....keep haikuing? Pretty sure that is not a verb, but you catch my meaning. By the way I am in Gorham, NH and will be entering Maine tomorrow. Love and miss you all. I find myself loving life and what it has to offer. Boredom is far from reality. What a privilege it is to live in a country where I am free to travel, free to live where I want for as long as I desire, free to dream, free to achieve those dreams.